In the first session, I pretty much let Sophie decide what we do. This time, I thought a little guidance would be appropriate. Firstly, I could see where we’re going: If we put some opponents in, we can very quickly reach a playable stage, where we see a little action and challenge on the screen. That’s important to keep the interest up. Secondly, having a plan in advance allowed me to do some preparation. The preparation I did was to find and prepare an image of a Dalek. Web search, cutting out the background, scaling. I thought there’s no real value in making Sophie do that again – we’d rather spend the time looking at code. After dinner, both girls walked around the room, shouting EX-TER-MI-NATE! repeatedly. Clearly, this was the most exciting idea right now, so we decided to deal with the sound first. To do sound, you essentially have two choices: find a sound sample on the internet, or make it yourself. Having tried both many times before, I find that making it yourself is both easier and more fun. So I fired up some sound software. I use Audacity, a very nice and free audio recording and manipulation program, but just about anything that records will do. We plugged in a headset with a microphone, and both Sophie and Feena did their best Dalek impressions. We picked one of the various “Exterminate” variations they produced. This effect gives the sound a slightly metallic feel. Export to .wav, and we’re done. That turned out to be a good start, because doing those Dalek impressions was good fun, and Sophie is now keen to get them into her project. So we fire up Greenfoot, and are back in space with the Doctor where we left off. When we try this out (compile, place the Doctor in the world, place a Dalek in the world, and hit Run), it looks pretty good already. Except that the Dalek only moves to the left, and stops moving when hitting the edge of the world. But Sophie discovers one very interesting thing here: she can now create two Daleks. Or three. And they all move! She needs to write the class only once, and can have many instances! 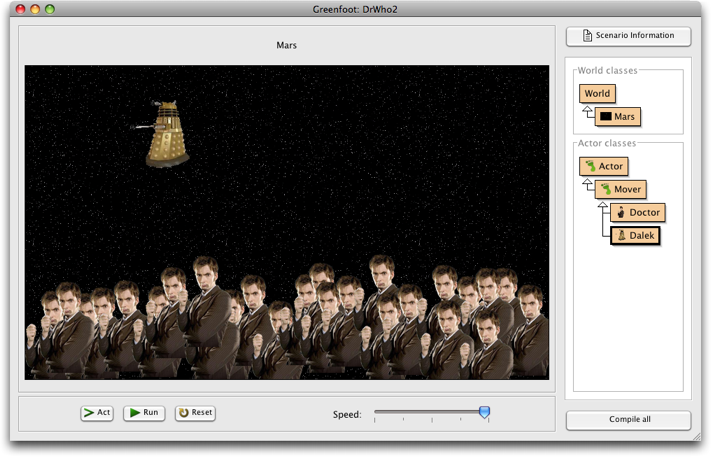 Okay, we decide that the Daleks should always move sideways, back and forth over the screen. I thought about this a bit. There are several possibilities here. One of the nice things about Greenfoot (and about object orientation in general) is that you can provide users with an API as simple or as complex as you like it. I write the Mover class, Sophie works in the subclasses. By providing the right methods, I can make life easier for her. Or harder. Depending what level we’re at. 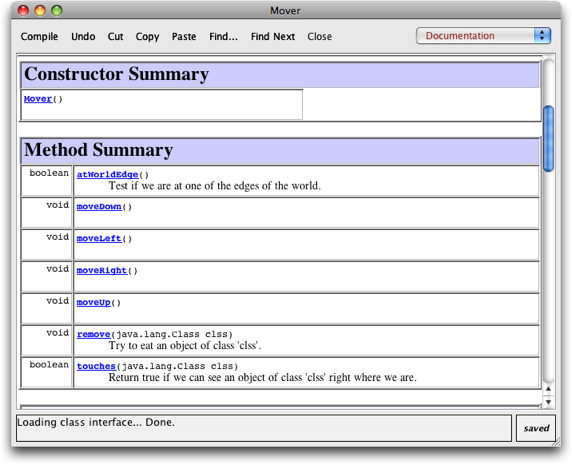 So I considered adapting the Mover to have a move method and a flip method. It would then remember the direction it’s going in, and the Dalek code would just call move() and flip(). I decide against it. I think we are ready to handle more if statements and a new thing: a variable. Now this should work! We try it out, and — it doesn’t! The Dalek just got stuck at the edge of the world again and doesn’t turn. So I fixed the error, and we tried again. Now the Dalek actually went back and forth. HURRAY! At the moment, the Daleks move nicely (by themselves), and we can move the Doctor with the keyboard. Good. Here, Sophie discovers something interesting: The Doctor can actually move diagonally as well! Just hold two keys down (say, up and right) and off he goes. Sophie finds that “very cool”. I hadn’t thought of that. But the way the code is written, it makes sense of course. Sometimes it is unexpected things that make a difference. Currently the Doctor can still run across the Daleks without anything happening. The next thing, therefore, is to make the Daleks catch the Doctor. 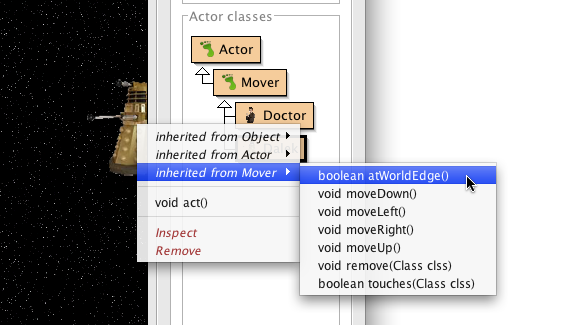 Again, I have thought about two helper methods to provide in the Mover class: boolean touches(Class) and void remove(Class). The first method returns true when the Dalek touches an object of the specified class. The second method removes any overlapping object of the specified class. * Return true if we touch an object of class 'clss'. * False if there is no such object here. I thought it was rather unfortunate that we have to write the “.class” after the Doctor class name. I thought it looks confusing, but Sophie didn’t seem to be worried. She just accepts it (as kids so often do), and we get on with it. Now, we’re almost there. The girls both want to play (and they do a bit) but we want to do one more thing today: put the sound in. This is actually easy now. We take our sound file that we produced earlier. We had it saved under the name “exterminate.wav”. In Greenfoot, every scenario has a folder with a few standard sub-folders, on of which is called “sounds”. 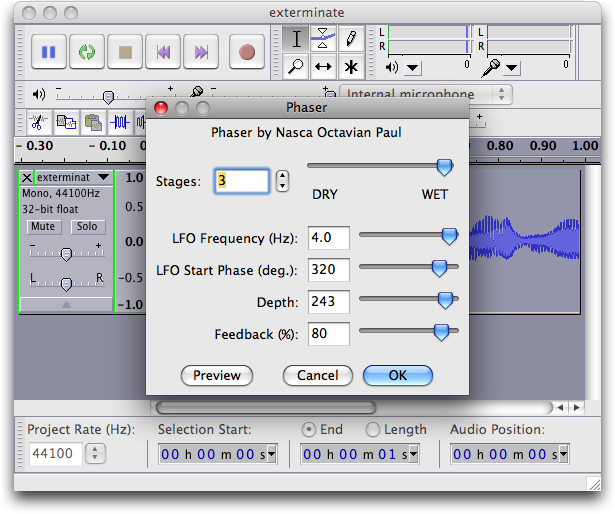 Sound files are accessible to the actors, if they are stored in the sounds folder. 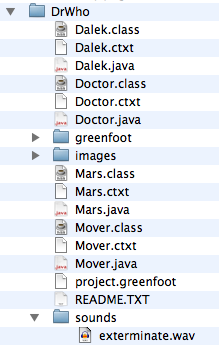 So we just move the “exterminate.wav” file into that folder. That’s it – we’re done! We place the doctor and three Daleks into the world, and the girls are off playing. Using the Greenfoot Export function, it’s easy to turn this into an applet now (which I am doing now as I’m writing this up, so that you can have a go with it yourself). Try it out. The girls both play for a while. They try to move the Doctor from the bottom of the screen to the top, and back to the bottom without getting caught. A few other interesting things happen. Sophie says “I wonder what happens when I have more than one Doctor. Do they all move at the same time?” So she creates several Doctors and tries it out. It works. Before you know it, Sophie and Feena have filled the screen with dozens of doctors, and put a few Daleks in to EX-TER-MI-NATE them all. The sound is hilarious. That’s it for this session. All in all, it took about 45 minutes until we reached the final version, and then they spent another 15 minutes just playing around with it. You can get the full source code (as a Greenfoot project) below. I’m curious where it will take us next. 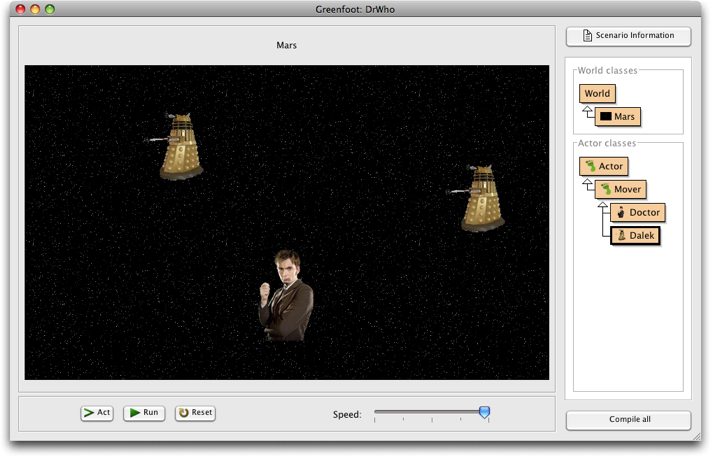 This entry was posted in Greenfoot, Java, Programming, Teaching and tagged coding, Dr Who, Greenfoot, Teaching by Michael Kolling. Bookmark the permalink. Fascinating project, this. I’m curious to see where this leads. hey thats fantastic. So cool. Love reading the posts keep it up. Your daughter is brilliant. I wish my girlfriend could make something like that. lol. I remember myself writing Basic code on a sheet of paper when I was ten or eleven. I read books about programming but I got no computer at that time. I wish I could have fun with something like Green foot! Great job, Michael, I salute you! I think the dalek voice effect might be done by turning the sound on and off very rapidly. I don’t know if Audacity can do that, but its Tremolo effect provides a reasonable approximation. Try setting wetness to 100% and frequency to about 70Hz. I loved this project. Good luck for you and your daughter. Also, I came here from Stumble Upon. Thumbs Up for this page. Keep it up, I’m sure that this will be an enlightening experience for your daughters, as well as something to brag about at school! I’ll send over the pages about it as a comment. I really enjoyed this, I look forward to the ending. 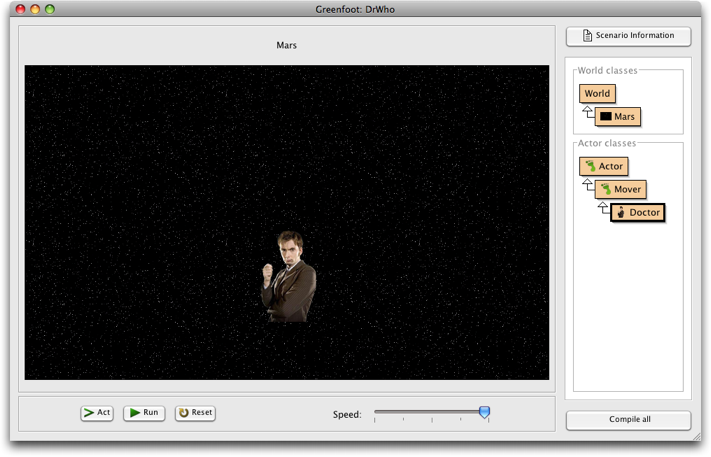 Pingback: Michael’s Random Thoughts » Teaching My Daughter To Code, Part III: Prepare The TARDIS! * Test if we are at one of the edges of the world. Return true if we are. I still do not how to translate in English movingLeft=true or movingLeft = false; what does the true or false mean here. If true is replaced by false and vice versa, what does it mean? No pgorammer at all , merely try to understand concept I have been struggling .